The Vedic teachings say the highest truth has both male and female aspects. The female nature is called shakti ("the energy") and the male shaktiman ("the energetic"). They are one and different simultaneously, like the sun and sunshine; each gives meaning to the other. 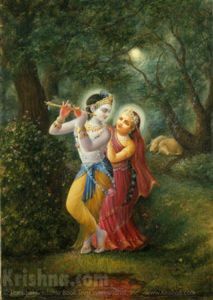 The male and female aspects of the Supreme Being are described in histories like Srimad-Bhagavatam, Ramayana and Mahabharata, where They appear together as Vishnu and Laksmi, Rama and Sita, and Krishna and Radharani.